In support of my album Bird Drugs, I’ll be going on a mini-tour with Brendan K. O’Grady and Duncan Carson, the two comedians behind Sure Thing Records. It’s a staggered tour, to drivable cities, on mostly weekends with a big break for SXSW. 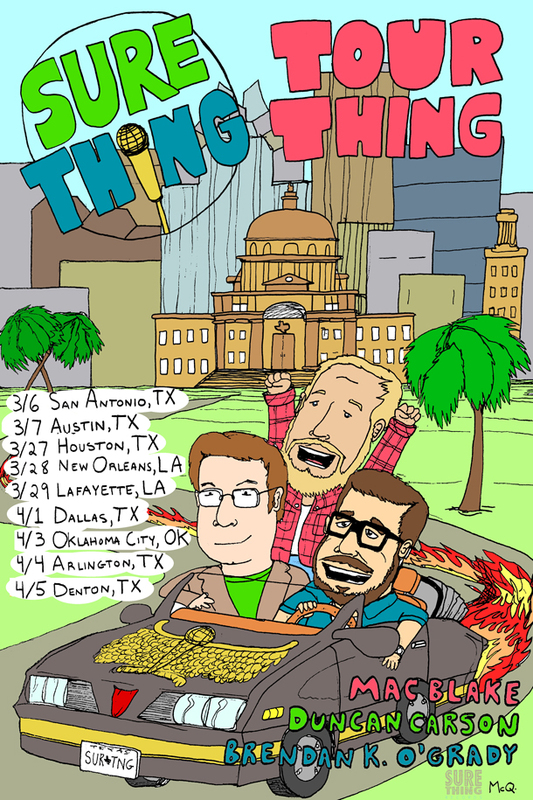 So “Tour Thing” seemed like a very appropriate title. It should be a lot of fun and a chance for the three of us to really grow to hate each other. Foster some bone-deep contempt, know what I mean? The kind of getting on each other’s nerves that could quickly escalate into a prison-style shanking. We’ll have plenty of CDs and beard stubble with us, so if you live in Texas, Louisiana, or Oklahoma, check out my Shows page for more info.